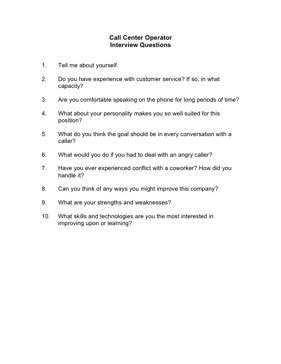 Choose your next Call Center Operator with the aid of these helpful interview questions. 3. Are you comfortable speaking on the phone for long periods of time? 5. What do you think the goal should be in every conversation with a caller? 6. What would you do if you had to deal with an angry caller? 8. Can you think of any ways you might improve this company?